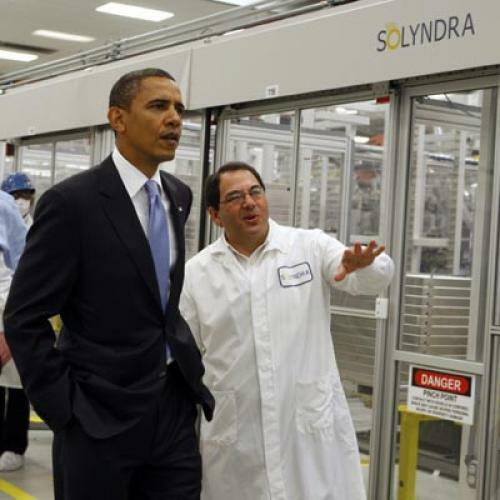 Don’t let Republicans set the terms of the Solyndra debate. As everyone by now knows, Solyndra, a California-based solar panel manufacturer, has gone bankrupt and defaulted on $535 million in loans, the payment of which was guaranteed by the Department of Energy (DOE). And, as everyone also knows, a White House official, who was connected through his wife to a law firm that worked for Solyndra, may have inappropriately involved himself in the loan process. The apparent conflict of interest inside the administration is inexcusable, of course. And it’s obviously not a happy occasion when a company defaults on government-backed loans. But what’s most inexcusable here isn’t the failure of Solyndra. It’s the ideological use that Republicans are making of the entire episode. Representative Cliff Stearns, chairman of the House Energy and Commerce subcommittee on oversight, seemed to speak for many on the right when he recently argued for nixing federal support of green energy. This gets things exactly backward. If anything, the DOE needs to increase, not abandon, its funding for clean energy. All the focus on this one problematic loan—which represented only 1.3 percent of the loans that the DOE has backed—badly misses the bigger picture: Because we are paying a heavy price in pollution and global warming for our promiscuous use of fossil fuels, and because oil is eventually going to become too expensive, the United States simply has to wean itself off traditional sources of energy. And we are not going to do so without government investment in alternatives. The reason is that the private sector cannot develop clean energy industries on its own. Factories that make solar panels or advanced batteries can cost more than $500 million. The payoff on these investments may not come for a decade, until the price of production falls as a result of new innovations and efficiencies. The industries also have to develop in tandem. You can’t have viable electric cars without new battery technology and without a smart grid that can prevent power blackouts. And, if the electric grid is still dependent on oil and coal, what’s the point? So the funding has to be extensive and long-term, and has to include manufacturing as well as research and development. The United States started to head down this path during the Carter administration when the DOE was created, and by the early ’80s we were far in the lead internationally in renewable research, manufacturing, and installation of facilities, or “deployment.” Then the Reagan administration took an axe to President Carter’s initiative. It retained small sums for research, but eliminated funding for manufacturing and deployment. As a result, the United States lost its advantage. In solar manufacturing, for instance, we now lag behind China, Japan, Taiwan, and Europe. The Obama administration tried to do something about this. Its stimulus package included $34 billion in grants and $134 billion in loan guarantees to boost solar, wind, and geothermal energy production; battery technology; electric cars; and the prospects for a smart grid. According to energy experts, it will take decades to see whether President Obama’s effort succeeds. Yet, while the DOE has only paid out a portion of its money thus far, there are signs that the administration’s program is having an effect. The electrical capacity of solar installations more than doubled from 2009 to 2010. The United States is exporting more solar products than it is importing, and the solar balance of trade went from $723 million in 2009 to $1.8 billion in 2010. The DOE has already helped to fund 48 new advanced battery projects in 20 states. It has underwritten the installation of five million “smart meters,” which monitor household energy use in real time, leading to more efficient consumption. And it has funded 10,000 charging stations for electric cars. If the administration’s program is sabotaged, as Carter’s program was, then all these efforts will be for naught. That’s apparently fine with conservatives like Stearns, who seems to think the United States would be better off ceding this economic territory to others. “We can’t compete with China to make solar panels and wind turbines,” he has argued. Buying technology elsewhere is certainly an alternative. But it would put our energy security in the hands of countries that may not have our best interests at heart. It would widen the trade deficit. And it would cost millions of jobs down the road. According to a Brookings study, clean-economy efforts already account for 2.7 million jobs. All of which is to say that the debate over government funding for renewable energy will have major consequences—environmental, economic, and geostrategic. So far, the Obama administration has been steadfast on this issue. We hope that won’t change. It is imperative that liberals win this fight.